Raving Persuasions: Was writing this on my list of things to do? Hey! What's a picture of me doing on here? This isn't Tumblr! 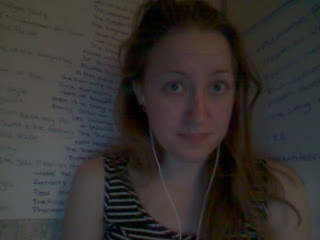 To the left of me is a long list of books that I plan on reading. I intend to cross them off as a I finish each one to give me a sense of accomplishment. To the right is an bullet-pointed plan of the rest of my summer, containing such helpful and detailed plans such as "running" and "job?" I like lists. They're encouraging; a scribbled out phrase to remind you that you have, indeed, done something with your day/year/life. The problem is that I very rarely stick to my lists. Once they're written, I already feel like I've accomplished something: I have a schedule, so of course I have time to watch just one or twenty more clips of JKR interviews... The satisfaction is worth it, though. A totally completed to-do list? Rare perfection. Really rare, though. I have... let me count... seven variations of to-do lists saved on Word, each with increasingly desperate titles ("To Do,""To do this summer," "TO DO!!"). Opening them up, I appear to have totally completed about... zero of them. My life is a sham. However, I am currently power-reading through Madame Bovary -- a book that I find strangely yet thoroughly relatable, given that a fair number of people who read it apparently hate the main character -- so perhaps I have found my motivation after all. I find that suddenly realizing you're about to start your last year of high school and will be a legal adult in friggin' less than a year is a pretty good wake-up call.